Scorpio moon is not just about the emotional shadow work that helps us accept the parts of ourselves that we think we need to keep hidden, it is also about improving the more subtle parts of our integrity that we don’t need to over-sell. Nuclear treaties, blood moon eclipses, rain in California, and the firing up of the Large Hadron Collider at CERN? I smell the burning of feathers that belong to that elusive “Bennu” bird, known as the transcendent phoenix. Or is that just the Scorpio Moon? Since the moon is currently in Scorpio, I encourage you to look at the next few days as a dress rehearsal for the FULL MOON IN SCORPIO coming in early May; during the shadow period of the upcoming Mercury Retrograde cycle that happens in Gemini. The sun in Aries made a square aspect to Pluto, one of Scorpio’s ruling planet, which is currently in Capricorn. The spicy charge of the Aries sun encourages us to start projects and keep moving, while Pluto in Capricorn wants that to happen in the context of a foundation using a dependable and quantifiable process. So this is a great time to reach for your goals surrounded by Aries energy but Pluto’s tendencies towards transformation and regeneration. Just be careful of how you use any power or influence to get your wishes because the download of the full moon in Libra is packing a powerful karmic punch that is pushing us towards equilibrium and reconciliation. We are experiencing the energy of the full moon working with the struggle between the cosmic bodies in the Cardinal signs. This means we are likely to see big shifts in government policies that stem from individual attitudes from people from every rung on the ladder of social strata from top to bottom. But don’t think that these energies will impact you on a political level. Since Ceres is in Aquarius you may also get the sense that the nurturing, care and concerns from those that are closest to you come across as a smothering and repressive force when the intention will be to help you include the quality of your life. Since there is a lot of talk regarding assigning Ceres to Virgo and Cancer, you can easily see how this unintentionally “smothering” energy could potentially over-reach causing people to unload their anxieties at your feet. Pallas Athene’s current position at 29º Sagittarius harmonizes with all of the cosmic bodies in fire signs, giving form and action to the wisdom that we have cultivated from personal challenges. Be mindful that the Scorpio Moon has a special connection to our shadow self; that part that we sometimes shun out of shame or judgment. Since Black Moon Lilith is in Virgo anything that you are repressing can easily get released in a moment of folly. When I say “released,” I don’t mean white doves at your dream wedding, I mean the steam of a pressure cooker that has been boiling for hours. It is best to let the steam off a little at a time so no one gets hurt. Since we all tend to have magnified psychic awareness during moon in Scorpio, be careful not to personalize the opinions, behaviors and reactions of others. IT’S SO NOT ABOUT YOU! The next few days will be an overload of positive and negative emotions. So do yourself a favor and focus on the positive because Scorpio can be festive when they focus on the good in the world. For those of you that need a reminder, forget the scorpio that takes notes about our sins and think about the ridiculous fool that is Scorpio when they are lovingly obsessed with something or even better, someone. Try not to withdraw because the conjunction of the Aries sun and Uranus in Aries set this week up to be more exciting than a hybrid between an Indiana Jones movie and a Star Wars movie. Don’t be surprised if you find yourself in shockingly intimate conversations that make you feel like you are naked and wide awake in a dream, far away from your comfort zone. 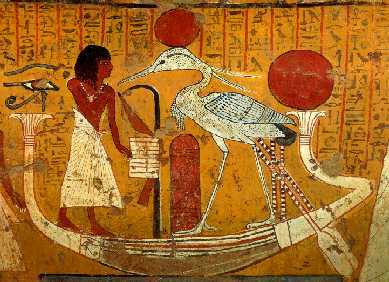 The bennu bird reminds us to remember every challenge that we have met and transcended. With Mercury in Aries you will be feeling sharp, sassy and very petulant at times. Just keep in mind that if you choose to get into verbal acrobatics, expect that there will always be someone around that will be just as verbally nimble as you are feeling. All of that smart-mouthed sassiness can easily become physical and somewhat telepathic flirtation while Venus is in one of her home signs, Taurus. Since your actions tend to be more deliberate, grounded and consistent, try and use the energy of Mars and Venus to leverage a lot of healing in your romantic relationships and within your family. The classical connection of Scorpio to Mars and the modern connection of Aries to Mars lend themselves to the Scorpio moon’s finesse with getting us to take a walk on the wild side instead of playing it safe. Nothing ventured nothing gained? Right? Mercury in Aries trines with Jupiter in Leo just before the cosmic lion king stations retrograde on April 8th. And not a moment too soon. You need a break from all of that over-thinking that you did this weekend. Since we are all deep into healing the wounds of all relationships that were exposed under the lunar eclipse, expect to see a lot of people going beyond their boundaries to reach their goals so that they can claim achievement. Be mindful of sharing power and leadership obligations and opportunities this week. Remember that everyone has an ego that they are negotiating with and the Scorpio energy will be expecting you to be a hero ego over being a venomous scorpion. April-The Month Ahead: CARVING CLARITY OUT OF CONFLICT! from Astrolosophy on Vimeo.